We just spent a week on the Intracoastal Waterway, and I am still trying to figure out what just happened. Sections were blackwater, dark red or brown water that is stained by tannins from decaying vegetation in the watershed. There’s a bunch of other stuff that is ecologically unique with blackwater, and I’m hoping to learn more about that as well as the two larger inland waterbodies we cruised, the Pamlico and Albermarle Sounds. § 2 Responses to blackwater on the ICW"
What else is ecologically unique? Dying to know more!!! Well, its a different pH, dark but not turbid, different plankton than whitewater nearby…I have inquired with some folks at Duke Marine Lab who study the stuff. More will be revealed! 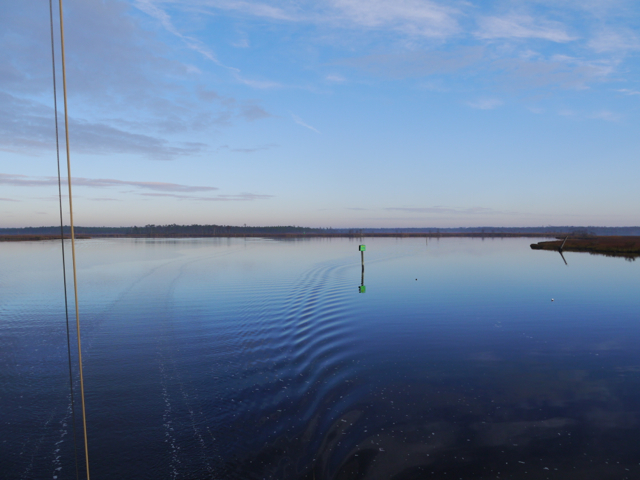 You are currently reading blackwater on the ICW at plankton every day.